Hi Leon, I’m glad Ness has been able to help you out. Please let us know if you need any more advice during your project, and we’d certainly love to hear how it’s going. If you’ve got any photos, before and after, please feel free to post them on the forum too. Obviously of the stair, but what about a picture out of the window showing off the scenery in North Wisconsin. I’m sitting looking out at a rainy scene in England right now, I reckon autumn where you are looks pretty impressive. Any problems with resizing any images so they fit, just let me know and I’ll sort you out. Welcome to the forum and thankyou for your post. I’m not sure that I understand perfectly the setup of your stairwell, but here is a first try. From what I think I understand. If I have understood correctly, your stair has a sort of S shape and if the dimensions are what I understood, then globally, your stair should work out fine. Here is a preliminary StairDesigner model of your project, that will have to be tweaked, according to a few details like wood thickness and assembly details around the first floor and last step, etc. The way to verify a project like yours, is 1st to draw the stairwell in a CAD program, then using the dimensional’s of the stairwell set up the stair in StairDesigner to make sure that it fits building regulations. You have to be careful though because StairDesigner works from the stairwell dimensions and not from the height and width of the steps or from a stair inclined angle. When using StairDesigner you have to hold in mind that the program will try to calculate the best stair fit for your stairwell, and not the contrary, which would be to calculate the overall stairwell necessary for a stair with specific characteristics. 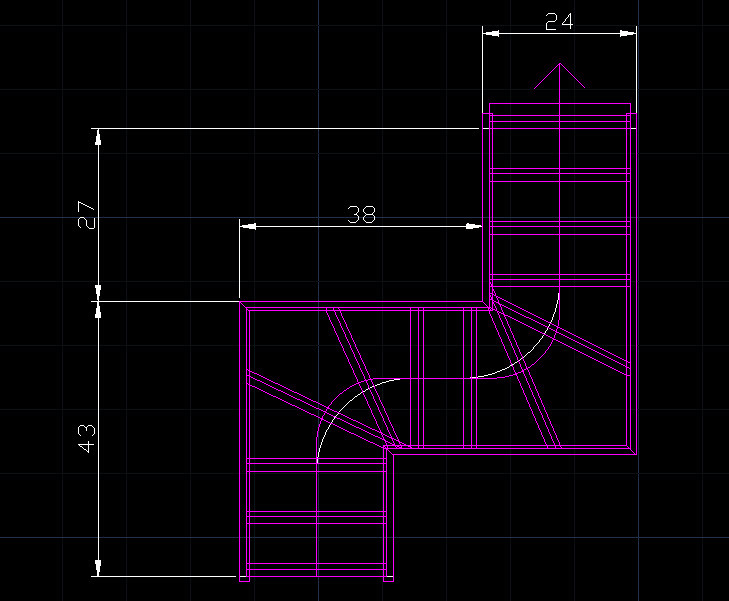 I attach also a screen capture of the project set up in AutoCAD, please tell me if I have understood the dimensions? Before we move forward, can you tell me if I’ve understood the general configuration of your stair? Numbers are in decimal inches. Ness thank you for your quick response.What you sent me back looks like what I was thinking and exactly how I sketched my project.I will look it over a little later today and get back to you if thats ok with any question .Are you numbers in mm or inches? I need help, I took out a membership and watch the tutorials but can’t seem to find my way in to planning. I am replacing a fold down stair, limited room. I have all the proper measurements and believe it will work, just need to verify with your software that I’m right. I can’t get started using your software. I have a 105 in. rise from ground to second floor and starting from ground going up two steps, using three step to turn right, going up one step, then using three steps to turn left, then finishing off with three steps to reach the second floor. Total of 105 in. rise with 8.5 in. rise per ( including 1.5 in. per) step with an 8 in tread and a total of 12 steps. The step width is 24 in. Can you advise me how to verify with your software?